We have babies! Bewick’s Wren babies, that is. We have a male wren that hangs around our yard every year, making nests. Apparently the male wren makes several nests each year to impress the female, and then she chooses where she wants to live. Well, the male has never attracted his female to our yard before, that I know of. I guess his nests were not good enough, or our yard not safe enough. 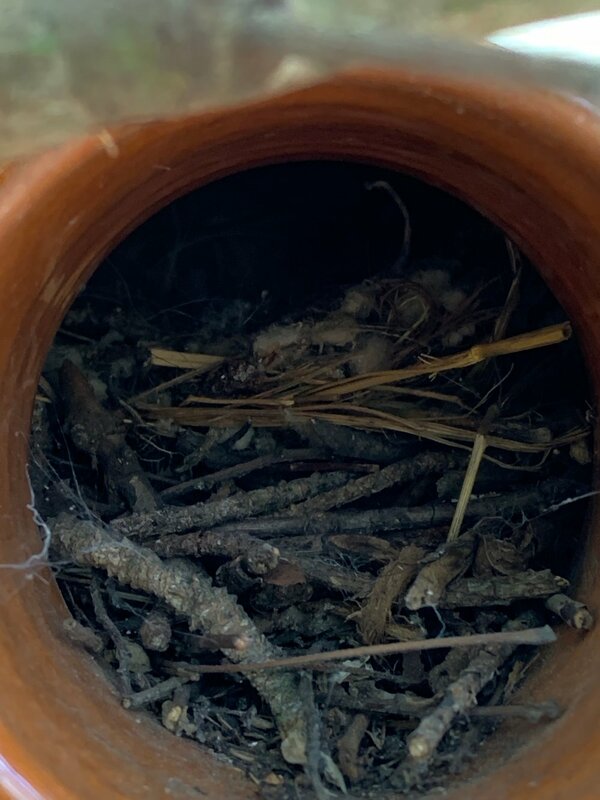 But this year, I noticed a nest going in the Williamsburg jar house that we have on Adam’s train shed. And a little while later, I surprised Mama Wren by looking inside. She flew out, startled, and I was mad that I scared her. I took this picture of the nest, but I didn’t think she came back. She did! And yesterday I noticed cheeping! So today I sat outside and filmed one of the birds coming back to the nest to feed the babies. It’s only 30 seconds long. This makes me very happy, indeed. I hope I can see the babies fledge. This weekend, we noticed a few things: One, the weather was going to be good for the next week (we were told HOT), and two, the tomatoes needed transplanting into bigger pots. I decided to go ahead and just plant them in the ground. It’s way too early. Here’s how I know: I just looked at the weather for the next week and it’s totally changed. It’s not going to be hot at all. Argh. Oh well, the tomatoes are in, and now it’s up to them to survive. 40 varieties. Oh, I used paint stirrers as my compostable plant labels, this time. They are quite large and stick up out of the ground beautifully, so I don’t have to squint to see them. Next weekend we’ll hope to get basil and cilantro planted, plus beans and cucumbers. The peppers need a while longer in the greenhouse, which is good, since the shallots and garlic aren’t ready to come out yet. Although it’s getting closer to that time!